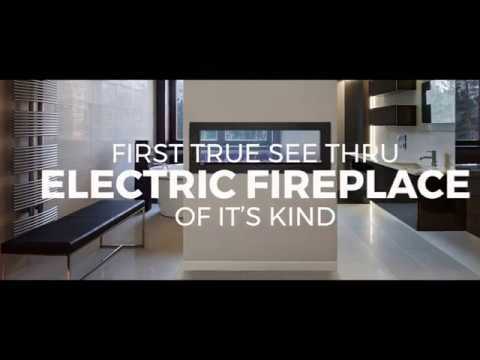 Shop the first see-thru electric fireplaces and upgrade your indoor space. 303 Indoor And Outdoor Multi-Surface Cleaner - 16 Oz. Make a bold and impressive statement in your home with the addition of this advanced, industry first solution from Napoleon. The first truly see through electric fireplace in the industry, the CLEARion is ideal in applications where a fireplace feature in desired in two rooms at once, such as a family room looking in to the dining room, bedroom into the bathroom, or even from a great room into the foyer. The design choices and options are virtually limitless with this new breakthrough technology. The patented flames flicker and dance with the same motions of a gas flame, creating the illusion of real fire. The unit comes with two ember bed selections that you can choose or swap out as you like. For a more traditional look, use the resin cast South Beach log set with topaz glass embers, or for a more contemporary appeal, use the sparkling, clear crystal ember bed. With the CLEARion, Napoleon also introduces electric fireplaces with dual zone heating. With its two faces, the fireplace offers two separate & distinct heaters. This allows you to set a specific temperature for one room, and either have the opposite room completely off, or set at a different temperature. Rated to produce up to 9,000 BTUs (hard-wired), the fireplace can heat up to a combined 800 Sq. Ft. A multi-function remote control is included with the unit and offers convenient, hand-held operation of the heater, flame speed, flame color, ember color, and on/off timer. The CLEARion features ten different ember bed color options; Orange, Red, Blue, Yellow, Green, Purple, Sky Blue, Magenta, White and Pink. There are three flame options: Blue, Orange, and Multi-Color. The CLEARion installs with relative ease and can either be simply plugged in or direct wired to 120V or 240V electrical systems. The unit is designed for simple installation into double 2 x 4 framing with an 8-inch thickness. This unit includes a black trim kit to complete the look of your CLEARion. Heating Area 800 Sq. Ft.
Electrical components and wearable parts such as fan/heater, motors, switches, nylon bearing components and remote controls are covered and Napoleon will provide replacement parts free of charge during the first year of limited warranty. Light bulbs and fuses are NOT covered by the warranty. Experience the one-of-a-kind look of the first truly see-thru electric fireplace on the market. Napoleon’s Clearion is the perfect fireplace to create an eye-catching focal point. It boasts an impressive selection of 10 different ember bed colors you can control with the touch of a button along a clear crystal ember bed and a South Beach log set. The Clearion also accommodates a double 2x4 wall installation and it has a thermostatic controlled heater. BTUs increase to 9000 when its hardwired. This set also comes with 2 different trim kits in black and stainless steel so you can match your fireplace to your décor. Enjoy the heat from both sides of this electric fireplace with dual zone heating you can control independently. This means both rooms can be at different temperatures and you can even turn the heat off from either side independently to completely customize your experience. 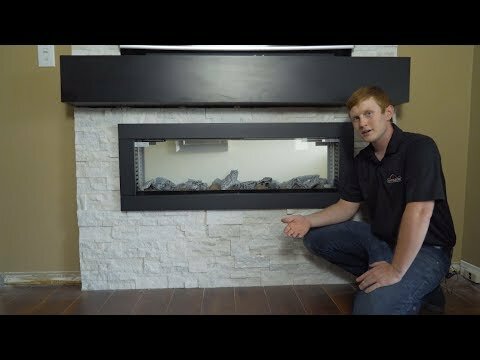 To truly enjoy this fireplace, you need to have it built into the wall. This means you’ll have to hire a contractor and, if you want hidden wires, an electrician to hardwire it for you. 800 Sq. Ft. 400 Sq. Ft. 400 Sq. Ft. 800 Sq. Ft.